1099-MISC forms can be keyed in or imported from text files, spreadsheets and IRS transmittals. 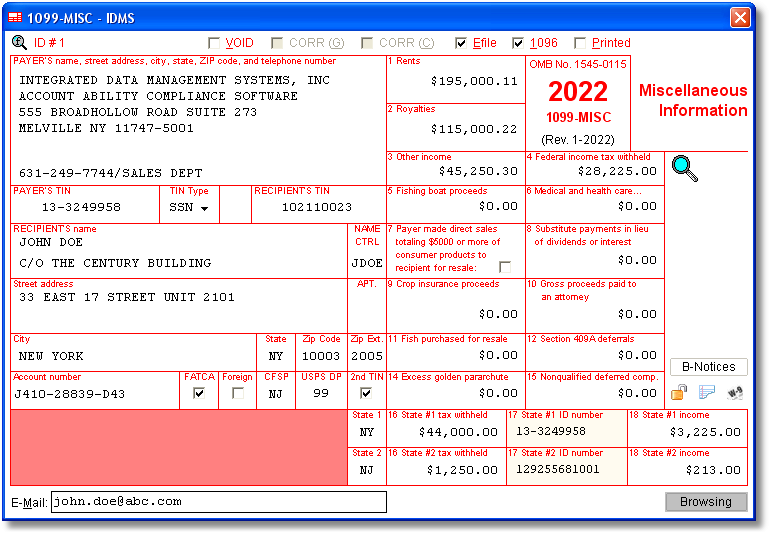 1099-MISC forms are easily maintained on user friendly windows resembling the actual IRS form (as shown above). Free 2019 overlays enable you to print and maintain 1099-MISC forms for 2019. Bulk TIN Matching module (included for free) checks Recipient name and TIN against IRS records. Electronic filing (E-FILE) of tax form 1099-MISC via IRS FIRE is included for free. Includes Combined Federal/State Filing for form 1099-MISC. Prints Second B-Notices (Backup Withholding Notices) upon request. Prints 1099-MISC Copy A on pre-printed fillable IRS approved 1099-MISC forms. Prints Recipient copies on blank paper (see SAMPLE OUTPUT below) or fillable 1099-MISC forms. Exports 1099-MISC forms to CSV text files compatible with Excel. 1099-MISC forms can be rolled foward from year-to-year at your option. Supports an unlimited number of 1099-MISC returns. Filters unwanted 1099-MISC forms in seconds. Calculates and prints Form 1096 for IRS or an information copy for your records. Includes quick access to the Windows calculator when needed. Includes current year and prior year correction processing. Displays IRS 1099-MISC reporting instructions and filing due dates. Recipient comments, visible only to the filer, can be added to any 1099-MISC return. Recipient copies can be delivered via Account Ability's optional Print and Mail Service. All of your 1099-MISC forms reside on your computer (or network), not ours. Detailed Control Reports help to validate your data prior to processing. Shop for 1099-MISC forms and envelopes.